As I made the journey across Bangkok from Suvarnaphumi to Don Muang airport, I pressed my forehead against the tinted glass of the bus window and took in the sights that the city has to offer as we travelled along the overpass. At one point I saw a few miles of lonely concrete pillars holding nothing, an unfinished project of some sorts that looked like it had been there for a while in limbo between construction and completion. It turns our that these pillars are the remainder of an attempted project to build a trainline from BKK city centre to Don Muang airport that failed following corruption and financial ruin. What I couldn’t see from my vantage point was that these concrete gravestones have become canvasses for street artists over the years, and quite a collection of graffiti is now there for all to see, and it is a bit of an urban tourist landmark. If you are interested in taking a look for yourself, you’d better hurry – these are due to be demolished soon to make way for a new railway. Or you can just check out this article on Coconuts Bangkok for more information and a slideshow of some of the artwork. I wish I had known about this, I would have loved to have a look for myself. 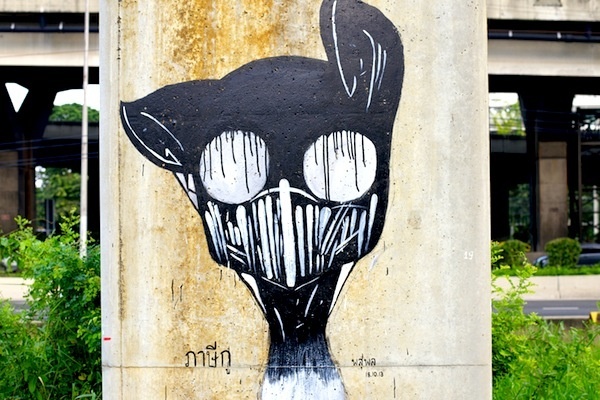 Posted on November 5, 2013 October 11, 2014 by cornishkyliePosted in Thailand, TravelTagged abandoned, art, bangkok, grafitti, street art, urban art, urban decay. Interesting choice of space for Banksy, cool that even his influence has reached all the way to Bangkok!